In the next three posts on politicians I will look at someone who is bigger than average, Eric Pickles, a particularly slim one, Jim Murphy, and then Nicolas Sarkozy, who is a smaller man. I will try to give some general advice for men who do not conform to the norm. 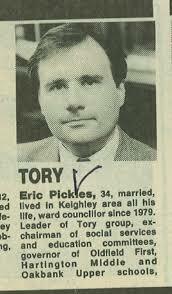 Eric Pickles is an overweight, Northern, Conservative politician. As can be seen in the photograph above he relies on braces to keep his trousers up and could do with a better fitting suit. The jacket sinks in the upper chest implying that it needs a bit more padding and support. What happens when you buy a big size to accommodate the width in the middle of the body is that you are buying a jacket for someone with wider and more angular shoulders. The trousers have a baggy, slouchy look, worsened by the hand in the pocket. The shoes Eric has chosen are obviously comfy and allow him to pound the pavements of Bradford or Ongar. But they do not help create a streamlined look. Style-wise this man’s clothes say there are more important issues than what you look like, and I would guess that he doesn’t like to spend much on clothes. But he is a show man, and likes to make an impression. This is how he looked when he started out as a politician – a fairly normal, smart business-man look. As he has put on weight, gone grey, lost some hair, and started to wear glasses some of the definition in his face has faded. It might be worth considering a slightly more interesting pair of glasses, perhaps in a dark grey, grey blue or muted green frame. 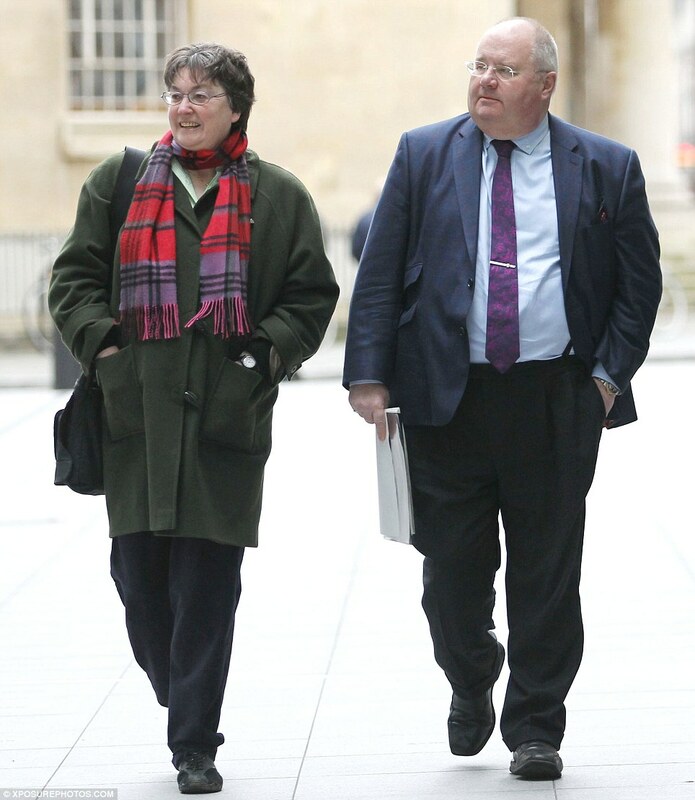 Pickles is ridiculed regularly about being fat. To some extent this is par for the course for politicians and people in the public eye, but it is undoubtedly hurtful. Many men become fatter as they age, as they give up sport and “settle down”. I have often noticed that having children seems to result in men piling on the pounds as their testosterone drops and they become more house bound. Last year Eric announced that he is trying to eat more sensibly and he walks considerable distances daily. Losing weight, he says,”It’s a really hard thing to do.” If you have a figure like Mr Pickles, and you find losing weight too hard, what can you do look good in clothes? Although the look on the left is a little theatrical the coat appears to be good quality, the hat elongates the rather round face, and the dark gloves and attractive green silk scarf pull the look together. The lighter green jacket, on the right, with its folds around the neck just emphasise the jowls. So if you are “larger than life” you would do well to buy good quality, tailored made outfits, as advised by Cedric Frederick. Cheap chain store items can look sensational on young, fit men. But on someone in the public eye, with a less than perfect figure, they can look unstructured and draw attention to the figure flaws. Also I have chosen these pictures as they show Eric in a muted colour palette which I think is more flattering to him than the bright orange and navy jacket shown at the top. When the Minister wears a white shirt with his jacket off, or a beige jacket he risks looking like a milkman. And very much larger than when he wears a dark suit or coat. If you are overweight it is probably best to avoid a light suit or being photographed without a jacket. Having said that the dark tie, darker braces and the jacket held over the shoulder is more sliming than the white braces in the third picture. It maybe that the photographer has chosen the most unflattering angle on purpose. When chosing a shirt a man shaped like Eric should choose a stiffer fabric to give more structure. A longer and more pointed collar would look better – Eric should avoid the button down shirts and the cut aways that he sometimes wears. A larger man needs a larger collar. Consider having shirts made to fit to avoid the multiple folds look. Eric’s ties are fine – deeper colours in plain or with diagonal stripes (avoiding horizonals). He sometimes wears it a bit too short, and sometimes a bit too long. The tie should reach the waist band. I am not sure about the tie pin. It is a little bit of a signature piece on a man who doesn’t do jewellery. But it provides a focal point at the top of the tummy, thus drawing attention to the problem area. It is also invariably skew-whiff. In terms of trousers the Minister should make sure they are the right length, without turn ups. Eric’s legs are relatively slim and he should emphasise this by avoiding baggy pants. The braces are a good idea in terms of keeping the trousers suspended at the waist rather than coming below the roundness of the stomach. But I would say they need adjusting a little so that the line is straight down vertically, rather than splaying out at an angle. Overall here is a politician who has a good sense of humour and who is not overly concerned about his appearance. A few changes, and a date with a tailor, could make a big improvement and set up Mr Pickles for the next stage in his career. I would love it if Eric would hire you as his attire/appearance consultant and we could see these changes. As usual, I think you are “spot on” here!